This is an electromagnetic radiation generated when a charged particle such as an electron or a proton passes through a dielectric medium at a speed greater than the phase velocity of light. Dielectric is a poor conductor of electricity and hence, acts as an electric insulator, which gets easily polarized by these charged particles. Molecules of this medium return to the ground state, emitting radiation. 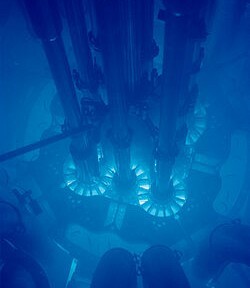 Nuclear reactors, displaying blue glow is a phenomenon of the Cherenkov radiation. Oliver Heaviside, a well-renowned English polyhistor discovered this phenomenon and published it in papers in 1888-1889. However, it was named after the Russian scientist, Pavel Alekseyevich Cherenkov, a Nobel laureate who was the first person to list the characteristics of the phenomenon in details. Usually, the speed of light in vacuum is denoted as “c”. It is also a universal constant as explained in electrodynamics. But the speed of light may vary while propagating through a material or medium and is most often lesser than c. However, the electromagnetic radiation emits when a charged particle travels through a dielectric at a speed greater than c, unlike light that would have traversed in the same medium, but with a decreased speed.The velocity, which must get exceeded, is actually the phase velocity of light and not the group velocity of light. The phase velocity can be made to fluctuate, using a periodic medium to generate the electromagnetic radiation with no minimum particle velocity. Such a phenomenon is known as Smith-Purcell effect. In photonic crystals- the periodic optical nanostructures, different types of anomalous or unusual Cherenkov effects can be observed. The electromagnetic (EM) field of the medium is disturbed when the charged particle travels through it. Dispersion of the electrons in the atoms of the medium takes place followed by polarization of the atoms, owing to the EM field of the charged particle. Emission of photons takes place when the electrons of an insulator again attain equilibrium. Radiation cannot be detected under normal conditions as these photons destructively interfere with each other. Sonic boom of a supersonic aircraft or bullet is a good example of Cherenkov radiation. The resultant sound waves propagate at the speed of sound. Similarly, a charged particle is capable of generating a photonic shock wave as it travels through an insulator. Cherenkov radiation is produced whenever the velocity \beta c of the charged particle exceeds c/n, where c is the speed of light in a vacuum, n is the index of refraction of the dielectric medium traversed by the particle. 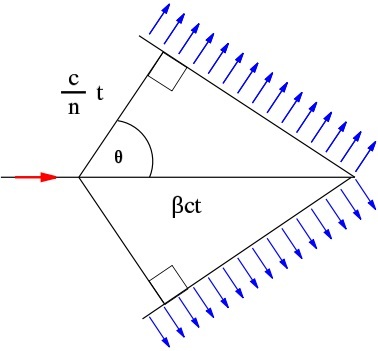 In the above figure, the particle indicated by a red arrow travels in a medium with speed vp in a such a way that c/n < vp < c. The emitted light waves, which is represented by blue arrows travel at speed vem = c/n. The superluminal light or faster-than-light is represented by the left corner of the triangle at t = 0. At a later time t the location of the particle is represented by the right corner of the triangle and travels the distance xp = vpt = βct. However, the emitted electromagnetic waves are restricted to cover the distance xp = vemt = c/n t. Therefore, cos θ = 1/nβ. The resultant ratio is independent of time. Identical triangles can be obtained by taking random times. Subsequent waves that are generated between t = 0 and t will form similar triangles where the angle remains the same. Negative index metamaterials have negative refractive index over some frequency range and does not occur in any other natural material. These synthetic materials have negative permittivity as well as permeability and are known to experience reverse Cherenkov Effect. In this case, when charged particles such as electrons pass through a medium at a speed greater than the speed of light, they radiate from a cone behind itself. The frequency pattern is represented by Frank-Tamm formula. It is continuous and does not have any characteristic spectral peaks. Higher frequencies are denser in this region of the electromagnetic radiation, thus appearing brilliant blue. The refractive index is a function of frequency and the intensity does not increase even at shorter wavelengths or for ultra relativistic particles. Cherenkov angle is zero at the threshold velocity for emission of the radiation. The value of the angle increases as the speed of the particle approaches the speed of light. It can be generated in the eye when any charged particle hits the vitreous humor- the clear gel between the lens and the retina of the eyeball. This normally gives the impression of flashes. Small amounts as well as low concentrations of biomolecules can be ascertained using this form of radiation. These biomolecules are initially labeled with radioactive atoms such as phosphorus-32 that are introduced through enzymatic and artificial means. In this way, various biological pathways and interaction of biological molecules such as affinity constants, and dissociation constants can be illustrated. It is also used to detect high-energy charged particles. The phenomenon may even assist in characterizing the remaining radioactivity of spent fuel rods. High-energy (TeV) gamma photon or cosmic ray interacts with the Earth’s atmosphere, producing an electron-positron pair with large velocities. The characteristic electromagnetic radiation generated from these particles can be utilized for detecting the source and intensity of the cosmic ray. It is also used to determine the several properties of astronomical objects, emitting gamma rays such as supernova remnants and blazars. Properties of the Cherenkov light emitted in a medium can be used to measure the velocity of an electrically charged elementary particle. Threshold counter is a simple form of particle identification device based on the phenomenon. The equipment determines whether the velocity of a charged particle is lower or higher than a certain value. If the momentum of the particle is known then particles lighter than a certain threshold can be separated. Ring imaging Cherenkov detector (RICH), the most advanced kind of detector was developed in the 1980’s. In this equipment, a cone of Cherenkov light is produced when a high speed charged particle travels through a gaseous or liquid medium called radiator. 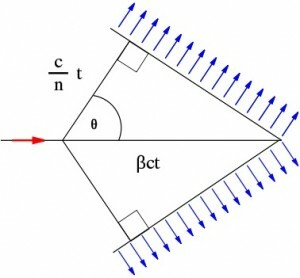 This light cone can be identified on a position sensitive planar photon detector that helps in forming a ring or disc whose radius is a measure of Cherenkov emission angle.